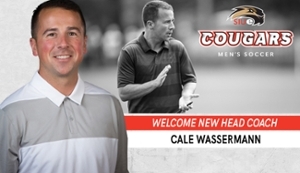 SIUE Director of Athletics Dr. Brad Hewitt has named Cale Wassermann as the eighth SIUE men’s soccer head coach in the program’s storied history. Wassermann comes to SIUE after serving as recruiting coordinator and assistant coach at Michigan State for the past four seasons. He assisted in all facets of the men’s soccer program, including summer camps and fundraising initiatives. With Wassermann on staff, the Spartans reached the 2018 NCAA College Cup, falling to Akron in the national semifinals. Michigan State reached the quarterfinal in 2017 and was dispatched in the 2016 NCAA first round by SIUE. While at Michigan State, Wassermann coached two All-America selections, 13 All-Region picks and 17 All-Big Ten performers. The Spartans had the Big Ten Freshman of the Year in 2016, the Goalkeeper of the Year in 2017 and the 2018 Midfielder of the Year. SIUE Associate Athletic Director Katie Zingg headed the search committee. “I especially want to thank Chancellor Randy Pembrook, Dr. Hewitt, the entire search committee, and the players and alumni for their support in this process,” Wassermann added. Prior to his stint at Michigan State, Wassermann served as the head coach at Division II Saginaw Valley State University (SVSU), where he guided the program to its first three NCAA Tournament appearances in 2011, 2012 and 2014. He led the Cardinals to the National Championship game in 2012 when the team set the program single-season record with 18 wins. Wassermann was tabbed as the 2012 NSCAA National Coach of the Year. He also earned recognition as the Great Lakes Intercollegiate Athletic Conference (GLIAC) Coach of the Year in 2011 and 2012. He amassed a five-year record of 64-23-15. The Cardinals had the 2012 National Player of the Year, while Wassermann also coached three All-Americans, saw 25 of his players earn All-GLIAC honors and had 16 NSCAA All-Midwest selections in five seasons at SVSU. In the classroom, four players earned NSCAA Scholar All-American honors. Wassermann spent the 2008 and 2009 seasons as an assistant coach at Lewis University of the Division II Great Lakes Valley Conference. The Flyers made two NCAA Tournament appearances including advancing to the Final Four in 2009 and the Regional Championship match in 2008. “The timing couldn’t be more perfect,” Wassermann said. “I want to hit the ground running, and I know there is a lot to account for. I am looking forward to building those relationships, and learning the ins and outs of SIUE. He also previously served as the head coach for the Under-18 USA Youth team for Maccabi USA and as the associate head coach for Detroit City FC in the NPSL. Wassermann began his coaching career as a volunteer at his alma mater, in 2006 and 2007 after playing four seasons at SVSU. He was a two-time team captain and twice earned first-team All-GLIAC honors. He received his bachelor's in communication in 2007. In 2015, he earned a master’s in higher education from Lewis. Wassermann holds a USSF ‘B’ License. A native of Southfield, Michigan, Wassermann and his wife, Shelby, are expecting their first child in May 2019.